Now, the retail industry is colliding with the mobile app economy. Just consider that, according to a recent IBM report, more than 18% of shoppers used a smartphone or tablet to access a retailer's website on Cyber Monday in 2012, an increase of 70% over 2011. Mobile made up 13% of total web-based purchases. The App & Mortar economy has arrived. 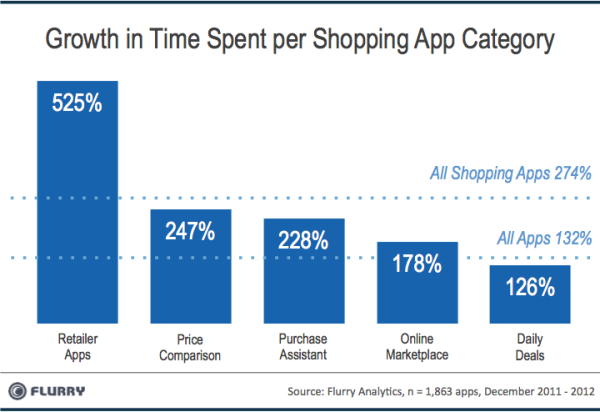 In this report, Flurry explores the shopping app category. For our analysis, we measured time spent by consumers across more than 1,800 iOS and Android shopping apps from December 2011 to December 2012. Shopping apps were found predominately within the Shopping category on Google Play, and within the Lifestyle and Food & Drink categories in the Apple App Store. From there, we broke down “Shopping” into five sub-categories: Retailer Apps, Price Comparison, Purchase Assistant, Online Marketplace and Daily Deals. Let’s take a look at how time spent in shopping apps is growing.